Oakland filed an antitrust lawsuit against the NFL, the Raiders, and the league’s other owners, seeking to recover damages resulting from what the city calls “the Raiders’ illegal move” to Las Vegas. Give it a movie title: The Town Strikes Back. After years of mistreatment from pro football owners, the city of Oakland on Tuesday filed a federal antitrust lawsuit against the NFL, Mark Davis’ Raiders, and the league’s other 31 owners. The suit seeks “to recover damages resulting from the Raiders’ illegal move to Las Vegas, including lost revenue, money that Oakland taxpayers invested in the Raiders and other costs,” said City Attorney Barbara Parker in a press release. A Raiders spokesman could not be immediately reached to comment for this report. The suit was filed in the United States District Court for the Northern District of California, in partnership with the law firms of Berg & Androphy and Pearson, Simon & Warshaw, LLP. The firms are working on a contingency basis, so their fees and costs will be paid only from any recovery, according to the city. Davis aims to move the Raiders into a new Sin City stadium by the fall of 2020. The leaders of two East Bay community groups — Griz Jones of Forever Oakland and Ray Bobbitt of the Oakland Coliseum Economic Impact and Legal Action Committee — hope the lawsuit stymies Davis’ plans. Ever since the NFL owners approved the Vegas relocation in late March 2017, Jones and Bobbitt have worked on making this lawsuit a reality. First, they hired Quinn, who has defeated the NFL multiple times in court. Then they patiently — and successfully — lobbied Oakland City Council members and Mayor Libby Schaaf for more than a year. The Oakland City Council authorized the lawsuit in July, with a motion that passed by a 7-0-1 margin. The vote’s one abstention came from Councilmember Lynette Gibson McElhaney. “I’m thrilled we are taking action to help protect our taxpayers,” Kaplan said in an email. When rumors of the lawsuit swirled earlier this year, some suggested the Raiders would refuse to play in Oakland for the 2019 season. In such a case, Raiders have not yet indicated where the team would play. Rumored options include San Diego, Las Vegas, San Antonio, and Levi’s Stadium in Santa Clara. Meanwhile, the lawsuit will not ask the court to prevent the Raiders’ move to Las Vegas or keep the team in Oakland. 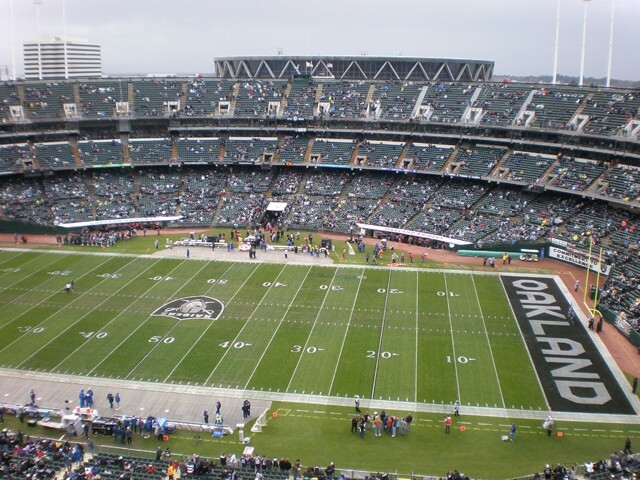 However, federal antitrust laws provide treble damages plus attorneys’ fees, so Oakland’s suit against the NFL and the Raiders “will seek a resolution for the maximum amount of damages available,” according to the city. Those financial damages might produce enough leverage to allow Quinn and his team of attorneys to convince the NFL to leave the Raiders’ name, colors, and logo in their birthplace: Oakland. All along, that’s been one of the main goals of grassroots leaders like Griz Jones.